Who could forget Tony Hayward's foibles, Gap's new logo or the Microsoft Kin? As we bid adieu to 2010, we remember 19 of the worst business moves of the year. 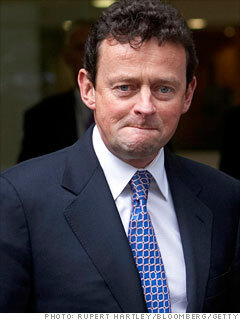 Did any one person have a dumber year than BP's disgraced CEO Tony Hayward? The lethal April 20 oil spill from the Deepwater Horizon rig in the Gulf Coast became a world-famous disaster and media circus. The company came under major fire (it didn't help that a month after the spill it was still promising that the impact would be "modest") and British citizens even campaigned for people to stop referring to the company by its original name, British Petroleum. The spill was bad enough, but Hayward's verbal spill following the disaster was even more embarrassing. "There's no one who wants this thing over more than I do. I want my life back," he told reporters on May 30. (You can imagine how much empathy this evoked from families of the 13 workers who lost their lives in the disaster.) In June, Hayward prompted criticism from both Rahm Emanuel and President Obama. It didn't help matters when he took a relaxing trip to Cowes on June 19 to watch a yacht race. On July 27, BP announced Hayward would be replaced as CEO, setting him free to watch yacht races in peace.